In the minds of most tourists, the words "dance" and "Istanbul" probably conjure up not-terribly-authentic images of belly dancers, or perhaps, for the more culturally astute, the whirling dervishes of the Mevlevi order. Few would likely suspect that they could find a roomful of young Turks enthusiastically doing the lindy hop, a style of swing dance that originated in the Harlem ballrooms of the 1920s and 1930s. I discovered the Swing Istanbul studio after being approached by the editor of Dance Gazette, the magazine of the Royal Academy of Dance in the U.K., with an assignment to identify and profile an interesting "dance tribe" in the city. 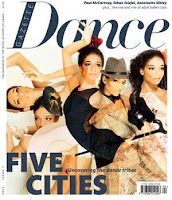 My piece about the Istanbul lindy-hoppers appears as part of the cover story for the magazine's February 2012 issue, along with dispatches from a male hula class in New York, a zumba class in Sydney, an experimental-art mecca in Shanghai, and a group of London zombies who just love Michael Jackson.